Announcement New Orleans religious icons, folk art style assemblage art: one-of-a-kind, made from found objects. Shrines, memory boxes re-purposed from vintage clock cases. This is a smoke free home. I do have several recycled cats, but they don't smoke either. They do dance, yodel, and create a ruckus at night, however. I suspect the prissy white female wears my best pearls under cover of darkness. What can one do with a prima donna feline? Stay awhile and browse, ask questions. . .enjoy your day! My dot com is www.luluredshoes.com and will bring you to my Etsy shop. And. . . ya'll come back! New Orleans religious icons, folk art style assemblage art: one-of-a-kind, made from found objects. Shrines, memory boxes re-purposed from vintage clock cases. This such an amazing Shrine that I can do so much with! I love adding to and repositioning my art and this is a perfect piece for that. Plus I got personal delivery from a super cool lady! Thanks for my fabulous heart ornament too. Will be keeping an eye on your ArT! This item is beautiful. Just as pictured. The seller was amazing & helpful. She even included some extra goodies that I was not expecting. Thank you so much!!! LOVE THIS FABULOUS SHRINE. HIGHLY RECOMMEND THIS ESTY SELLER TO EVERYONE. SHE GOES THE EXTRA MILE FOR HER CUSTOMERS NOT TO MENTION THAT HER CREATIONS ARE WONDERFUL. THANKS SO MUCH LULU!! "Crypt" made for cremated pet remains. (sold) Taking custom orders. What does one do in a 24 foot long travel trailer when your art supplies are in another state? Actually, I was a published and produced writer (fiction, copy writing, writing gigs) but found myself staring at the walls when displaced by a hurricane named Katrina with no computer and no writing supplies. They were back in New Orleans growing mildew and falling apart. Not having much space to work in a small travel trailer, I began making art dolls using found objects - - and found that doing so saved my mental life and changed my despair into delight. Art saves lives. I evolved from the small dolls into larger objects, and now that we're resettled into a home there's room (a whole room) for found and interesting objects, mannequins, bird houses, old wooden boxes, and "stuff". 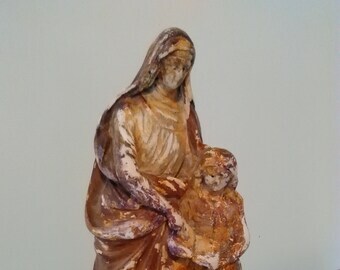 I particularly am drawn to blessed things belonging to different religions like vintage statues, rosaries, distressed shrines, and even old voodoo dolls. Everything has a history with found objects, but that history is a mystery in most cases - I love that. Take care, and may you make happy art. Lukie makes all the loom bracelets; he can make matching rings for you, also, or party favors.